I was standing in the wine section of my local grocery store searching for a nice Sauvignon Blanc. Checking out all the choices, I picked up this bottle and read the back label. 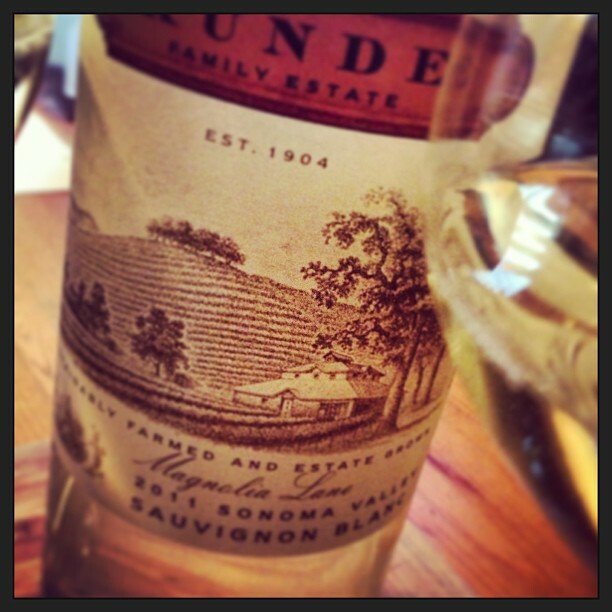 A friend of mine had given me the 2010 Kunde Sauv Blanc which I absolutely loved. The 2011 was also in a clear flint bottle and screw cap that I am becoming more and more fond of, so I figured “go for it” and I bought it. After purchasing this bottle for $14.99, I took it home and stuck the bottle in the refrigerator for later. If you were wondering if the Kunde Family Estate 2011 Magnolia Sauvignon Blanc is one of those wines to sip on while barbecuing, the answer would be “yes.” This wine works great for those hot summer days when you have some friends over to show off your skills at cooking a nice piece of salmon and vegetables on the grill. The Kunde 2011 Magnolia Sauvignon Blanc is sustainably farmed and estate grown. This wine at 13.8% alcohol by volume was a little lighter and thinner than I expected. Nonetheless, its light mouth-feel shows off some freshness in the glass. The aromas of tropical fruit, pear, and hint of kiwi dance together in the glass with some minerality. On the palate I found a very soft peach followed by grapefruit. There was a slight hint of oak which helped give it some palate weight. Without a doubt, it will try to flirt with you from the glass. It was not like the 2010 that I remembered, but it’s still a nice wine to serve to friends before dinner.